Audio DJ Studio for .NET is a native .NET component that makes it easy adding sound playback and mixing capabilities to applications written with Visual Studio.NET. Thanks to the integration with DirectShow, Audio DJ Studio for .NET can load, play and mix video files using formats whose specific codec is available on the target machine and, through the mentioned players, it can apply different sound effects to the sound portion of a video file. 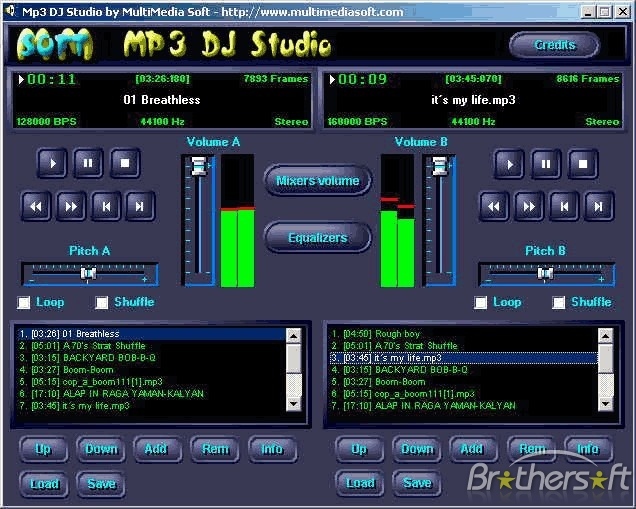 Audio DJ Studio for .NET can load, play and mix video files using formats . ...... Rate, Pitch and Equalizer values: each player comes with a set of embedded and configurable visual feedbacks like VU-Meter, Spectrum Analyser, Oscilloscope and Waveform. An embedded automatic fader can easily mix audio tracks loaded inside a playlist with an accurate and configurable fade-in/fade-out. Thanks to the integration with DirectShow, Audio DJ Studio for .NET can load, play and mix video files using formats whose specific codec is available on the target machine and, through the mentioned players, it can apply different sound effects (equalization, volume, DMO effects, etc.) to the sound portion of a video file. Audio DJ Studio for .NET is open to the external world of DSP effects: it can work with custom DSP effects developed by the developer himself and also with the multitude of VST effects available on the Internet. Streaming Audio Studio: Streaming Audio Recorder, Editor and Converter. Qweas is providing links to Audio DJ Studio for .NET 5.0 as a courtesy, and makes no representations regarding Audio DJ Studio for .NET or any other applications or any information related thereto. Any questions, complaints or claims regarding this application Audio DJ Studio for .NET 5.0 must be directed to the appropriate software vendor. You may click the publisher link of Audio DJ Studio for .NET on the top of this page to get more details about the vendor.